Instabilities at the surface of magnetic white dwarfs. 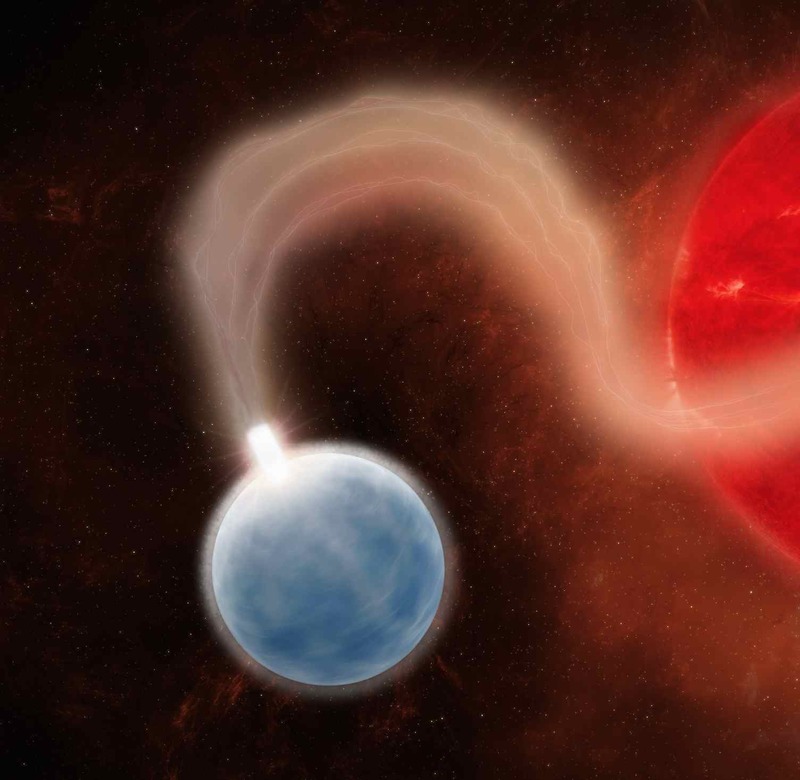 A team of researchers from CEA (Astrophysical Department and CEA-DAM) and the LUTH Laboratory (Paris Observatory) has just published a comprehensive study of an enigmatic phenomenon of quasi-periodic oscillations at the surface of strongly magnetic white dwarfs also called "Polars ". These dense stars are orbiting a companion and capture its material that falls freely toward the white dwarf poles. Strongly heated to millions of degrees, the hot gas or plasma then emits mainly in X-rays. Thanks to detailed numerical simulations of the plasma behavior, the researchers were able to reconstruct the existence of strong instabilities leading to rapid oscillations in the luminosity with timescales of only a few seconds. However, using the database of the XMM-Newton satellite, these oscillations were sought unsuccessfully by the team, in the X-ray emission of over 20 Polars. This contradiction leads today researchers to propose to study the phenomenon in the laboratory. Indeed, similar physical conditions can currently be replicated by large power lasers like the LMJ . The control of plasma instabilities is a key element for nuclear fusion by magnetic (ITER experience) ou inertiel confinement (laser Mégajoule) and instabilities of white dwarfs could contribute to a better understanding of this general phenomenon. These results are the subject of two articles published in the journal Astronomy & Astrophysics, July 2015. At the end of its life, the Sun will become a white dwarf. Having exhausted its nuclear resources, then the heart of the star collapses under the action of gravity forming a very dense star with a mass similar to that of the Sun but in a volume equivalent to that of a planet like Earth. Its density then reached over one ton per cm3. It is estimated that nearly 10% of the stars in the Galaxy have already been transformed into "white dwarfs". Some of them are highly magnetic with a magnetic field more than ten million higher than the Sun. When orbiting another star and close enough to capture its matter, these magnetic white dwarfs are called "polars" because the captured matter then emits emits a "polarized light" ie having a preferred orientation due to the magnetic field. Since their discovery in 1976, about a hundred of these binary systems has been identified in the Galaxy. The intense magnetic field channels the material that falls freely to the poles in a cylindrical "accretion column" of only a few hundred kilometers radius. In this column, the material reaches supersonic speeds of about 1000 km/s, creating a shock wave phenomenon similar to the "bang" of a supersonic aircraft. This pressure wave abruptly slows the matter and heats it so that it radiates in this little volume as much energy as a star, mostly in X-rays, ultraviolet and visible light. Between 1982 and 1997, rapid brightness variations were found in visible light among five of these "polars", suggesting the existence of instabilities. In complement to earlier work, the researchers from the CEA and the Paris Observatory have sought to reproduce on computer conditions in the accretion column. Using the HADES computer code, they produced very accurate high time resolution numerical simulations of the complex physical processes in the shock. 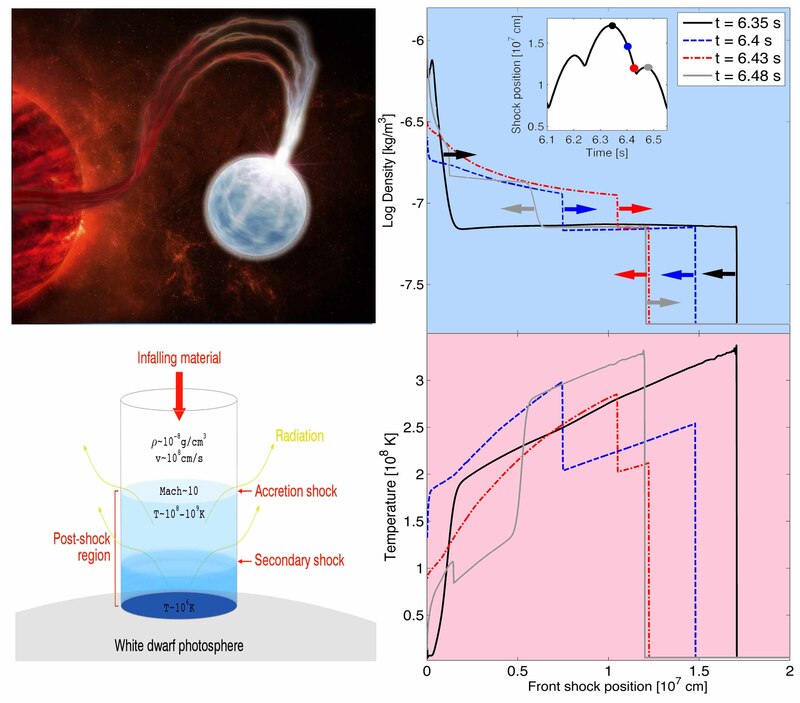 In most cases, these simulations have shown the existence of strong instabilities, resulting in a significant oscillation of the height of the shock over the white dwarf and thus of the X-rays luminosity for a wide variety of conditions. Only in the case of a strong magnetic field, together with a low amount of matter flow, these fluctuations can be greatly attenuated. 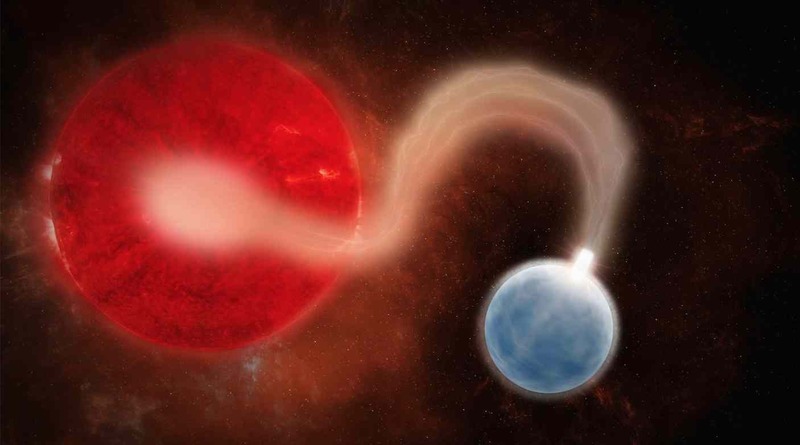 For the first time, the researchers could also clearly demonstrate the existence of a "secondary" shock that is "reflected" by the surface of the white dwarf when the material strikes the dense star. Left: Artist's view and detailed structure of an accretion column above a strongly magnetic white dwarf. Right: evolution of the density (top) and temperature (bottom) in the column height versus time for 4 consecutive times marked by different symbols (inset). Vertical discontinuities mark the presence of shocks which movements are indicated by arrows (the white dwarf surface is at position P = 0). For t = 6.4s and t = 6.43s, a secondary shock is clearly visible moving outward from the white dwarf surface. Copyright CEA. Scientists have searched the presence of these rapid oscillations, with periods that can vary from 0.1 to 10 s, in a set of "polars" observed in X-rays by the European XMM-Newton satellite. In the comprehensive database of the satellite, 65 polars were observed, of which only 24 were found bright enough to be able to provide a reliable indication of oscillations but none has reavealed the expected quasi-periodic variations. The detailed study has shown that some of these sources may have a magnetic field sufficient to dampen oscillations. 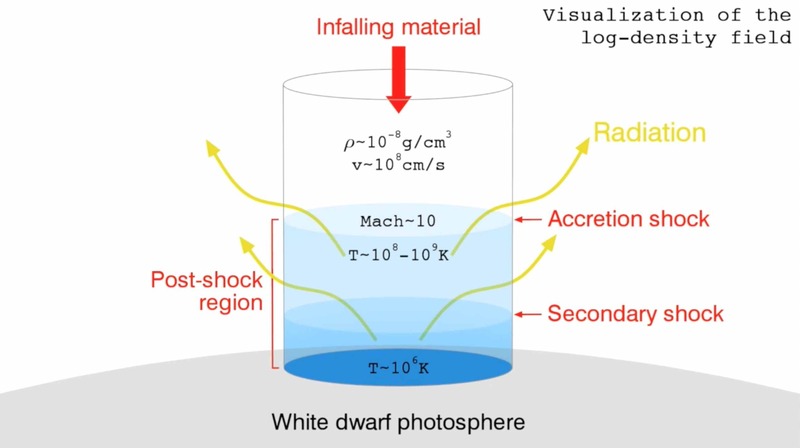 But despite the uncertainty over certain parameters (mass of the white dwarf, section of the accretion column,...), at least part of them should have shown rapid changes due to the oscillation of the shock. The absence of these oscillations is a mystery that seems to question the validity of the accretion column standard models which physics is yet considered well understood. To solve this problem, the researchers want to turn to an experimental approach still surprising for astrophysics. Indeed, advances in laser physics and the advent of high energy density lasers now make possible the production of laboratory conditions similar to those encountered in the accretion columns at the surface of white dwarfs. To do this, scientists use the concept of "scaling law" which states that a physical process will be equivalent to a different scale if certain parameters are in adequate proportions. This concept is particularly in use for example in wind tunnels where a small scale model airplane allows to test the behavior of large aircrafts as an Airbus 380. The CEA and Paris Observatory scientists were able to show that to replicate the speed of 1000 km/s and changes in second timescale in an accretion column of 100 km in size, it was equivalent to study the plasma produced by a laser with a speed of 150 km/s in a dimension of the order of millimeter, during a hundred billionths of a second. And these extreme conditions have become feasible on powerful facilities like the Megajoule Laser (LMJ). Experience Room of the Megajoule Laser (LMJ). At the center of this sphere ten meters in diameter kept under vacuum are focused a set of 176 laser beams. Concentrating all the laser energy on a target of millimeter dimensions, it can be created for a few nanoseconds conditions similar to those found on the surface of white dwarfs. Copyright CEA. As part of an experimental astrophysics project called "POLAR", the first experiments were conducted on the LULI2000 kilojoule laser installation at the Laboratory for the Use of Intense Lasers (LULI) of the Ecole Polytechnique. They allowed the choice of laser target materials, the development of experimental methods and to reproduce for the first time ever in a laboratory, the shocks encountered around white dwarfs. The potential future use of high power lasers, such as the NIF (National Ignition Facility) in the United States or LMJ (Megajoule Laser) recently commissioned, should allow, particularly in the context of the opening experiences LMJ-PETAL, to create a true model of the accretion column, paving the way for a real laboratory study of shock instabilities. See : the extended version of the video "Accretion column thermal instability from numerical simulations"
 LMJ (Megajoule Laser) laser facility of 1.4 megajoules being deployed in Barp near Bordeaux (Gironde, France) - NIF (National Ignition Facility), megajoule laser installation at Lawrence Livermore National Laboratory (California, USA).